I’ve made beer can chicken in the oven, but never on the grill. So this week, when I received an email from America’s Test Kitchen describing the best grilled beer can chicken ever, I decided to give it a try (watching their video is not a bad idea either, especially because they do such a good job of illustrating the charcoal arrangement method for optimum heat distribution). Making grilled beer can chicken is super easy and requires minimal prep work. I was a bit unsure whether I’d be able to keep the grill at the right temperature for the hour that this takes to cook, but I didn’t have any trouble. You won’t either if you remember one thing – do not remove the cover for any reason. For this recipe, I made a rub in two parts – spice rub that went under and on the skin, and a herb rub that is placed under the skin only. Both of these gave the chicken great flavor, and the steam from the beer made the chicken super tender and juicy. And as long as I was throwing the chicken on the grill, I decided to add a packet of potatoes as well to save me some effort in making a side dish. After you remove the chicken from the grill, it’s a good idea to let the chicken rest a bit before carving. During the naptime, remove the potatoes from the foil packet and toss with some malt vinegar and parsley for a tasty and tangy side. 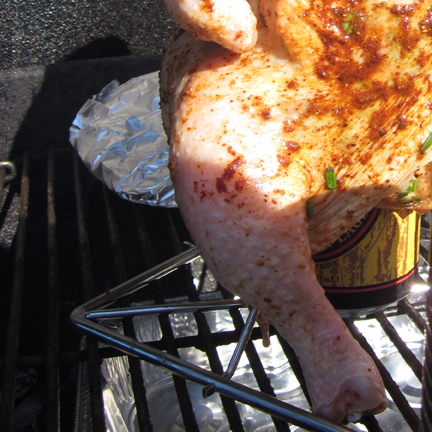 One thing about making beer can chicken – it looks weird, sitting upright on a beer can standard. Just remember, pre-grilling weirdness results in juicy, tender chicken just one hour later. Soak wood chips in water. Start grill; if using charcoal, use about 60 briquettes. Place chicken and beer on counter to allow it to warm a bit while preparing the rub. Combine oregano and chives, set aside. Combine chili powder through coriander, mix together. Loosen skin on the chicken, and put half of the spice mixture under the skin, then add herb mixture under the skin. Pat remaining rub on the outside of the chicken. Remove about 1/4 c. of beer from the can. Insert can into the chicken so that it looks like it is sitting upright (I used a beer can chicken stand to position it properly). In a bowl, toss potatoes with olive oil and season with salt and pepper. Using tinfoil, fold the potatoes into a packet so that it makes a box-like shape. Use several layers of tinfoil to ensure a good seal. Dump coals on outside edges of grill, add soaked chips on top of coals, place a disposable tinfoil pan in center, then place grill grid in place. Position the chicken in the center, potatoes behind it to receive indirect heat. Cover and grill for 45-60 minutes; keeping grill temperature between 310°F and 350°F. Remove chicken when thigh temperature reaches 170°F. Remove from grill, cover with foil and set aside for 15 minutes before carving. 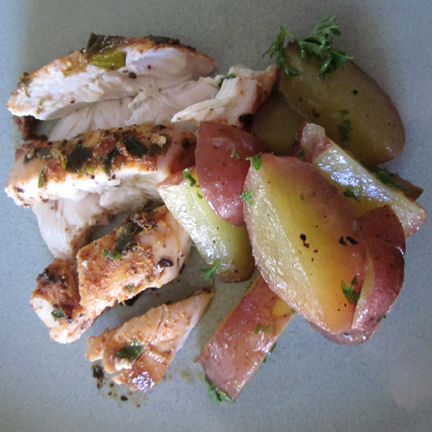 Remove potatoes from foil packet, toss with malt vinegar, parsley, and season with more salt and pepper if needed. Cover with foil and set aside until ready to serve. Bonus – Beer Can Chicken Playlist! I think every special occasion deserves a playlist. Holidays, special events, garage sales – I’ll make a playlist for just about anything, and Beer Can Chicken Month is no exception! Start the playlist when you place the chicken on the grill, and when the last song has played the chicken will be done (or almost done)! And in case you want one, here’s a printable version of the Official Beer Can Chicken Playlist CD cover.